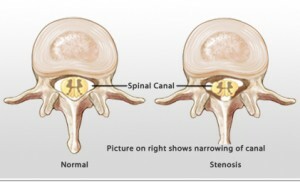 A common question we get asked is; do epidural steroids help spinal stenosis? The question is simple but the answer is complex especially if we honestly include what the published evidence says about it. Honestly discussing the published evidence is important because we hear so much about how providing evidence based medicine is our goal in healthcare. The problem with the evidence is we have to actually act on it, even when we don’t like what it says. This is the case of epidural steroids in the management of lumbar spinal stenosis. Contrary to what you might think we have actually sent patients out for epidural spinal injections for a myriad of spinal conditions. This is a treatment that we have found has it’s place in the care and management of patients suffering from spine and spine related pain. We send patients out for this treatment for two reasons; number one is when the patient comes in for the first time with pain so severe we cannot touch them. In order to treat this patient they might need something, like an injection, to remove some of the inflammation and pain, to get them to a place that our care will be effective. The second reason we would send a patient for an injection is if they fail to progress within 2-4 weeks of starting care. In this case we send them out, as in the first, to get a jump on the pain and make it easier for them to progress with our treatment. An epidural injection should never be done as a sole means to mange pain. It should always, only be performed as a part of a therapeutic treatment program such as ours. We know this through experience and through what the evidence says. By experience I can tell you numerous stories of patients who had an injection alone which only temporarily reduced pain, always the pain comes back. By looking at the evidence we see that epidural spinal injections do not fare well compared to placebo. This study published in the New England Journal of Medicine in July 2014 compared steroid injections with lidocane for the treatment of spinal stenosis to lidocane alone. Six weeks after procedure lidocane alone offered just as much pain relief as the steroid plus lidocane, indicating the steroid is no better than placebo. Another paper published in April 2015 compared epidural injection with placebo pill to sham injection plus gabapentin. Gabapentin is a drug used sometimes to treat leg pain related to compression of the spinal cord or spinal nerves. This paper found that epidural steroid injection might provide greater benefit than gabapentin for some outcome measures, but the differences are modest and not long lasting for most people. By experience and by the evidence epidural spinal injections are not a good stand alone treatment for spine and spine related pain. So do epidural steroids help spinal stenosis? I believe the answer depends upon the situation. Even in these studies some patients did better than the sham or placebo treatment and other studies have similar findings. Epidural steroids should never be the first line or a stand aloe treatment for lumbar spinal stenosis. They should be used the way we use them, when the patient needs something to decrease the joint inflammation to make therapeutic procedures like spinal adjustments, exercise, and traction easier to perform. It is ONLY in the therapeutic treatment where the best results are going to be possible. My interpretation of this evidence is that steroids alone are not effective to treat lumbar spinal stenosis but steroids may help the patient achieve some relief in the very short term to make the first several weeks of therapy easier. The problem with evidence is if it is really as important as we say, we need to act upon in it. In the case of epidural spinal injections for lumbar spinal stenosis, the evidence is not very kind. The evidence also is not kind to decompression surgery for lumbar spinal stenosis . For this condition the best option is therapy and we believe the best therapy is the kind that we offer. We use an approach that includes spinal adjusting, posture and core strengthening, balance training, whole body strengthening, and traction. This type of care is well supported in the evidence to bring about superior long term results. Don’t make epidural steroid injections your only treatment for lumbar spinal stenosis, or any spine related pain for that matter. If you or someone you know are suffering from spine or spine related pain come talk to us or chiropractors like us. We can help get you going in the right direction to find the real relief you are looking for.